For those living in older homes in Eugene, storage is always at a premium. Maybe you’ve acquired more in the past few years and need an organized place to store them? Maybe you’ve been using multiple closets and want to consolidate? Closet remodels are great home improvement projects for winter. You don’t have to be out of doors plus it can be easy and affordable. There are many benefits to having a clean, uncluttered and organized closet space. You can hang clothing and outer wear, as well as provide shelves or baskets for folded apparel. You can arrange and display accessories (purses, hats, umbrellas, shoes) and even have closets exclusively for items like crafting, sewing supplies and sporting goods. 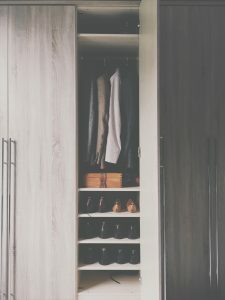 Whatever your need, closets are multi-functional spaces that we all need in our homes to help us put items away when not in use. Your existing closet can be expanded for organization and storage or expanded to create a walk-in space. Or you can turn another area of your home into a large walk-in closet. Many empty nesters find themselves confused about what to do with their child’s bedroom when they leave the house for college or their own apartments. If Mom has a large wardrobe that needs space to grow or if Dad has a memorabilia (sports, music, etc.) collection, you might think about turning your spare bedroom into a closet. First you need to determine what usage your new closet space will cover and create a design. There are great videos available at Youtube that will walk you through the steps necessary to design your ideal walk-in closet. You can also contract with a professional like Red Umbrella Services. Just call us at 541.515.3843. There are many different closet configurations. Part of designing your closet means determining what you’ll need for your storage. You might want to consider adding new lighting in – if so, consult with an electrician at by calling us. You could even add speakers so you can relax in your new closet while listening to your favorite music! Tools including hacksaw, power drill, screwdrivers and hammers, laser level and measuring tape. Check with your local hardware specialist after you have determined your basic closet design. They will help you pick out the right tools and materials for the work. Finding a place to put everything is just part of your closet design challenge. You also want something that is aesthetically pleasing and matches the rest of your home design. Just because there’s a door on your closet doesn’t mean you shouldn’t care about how it looks. For other storage ideas, you can double-up on hanging rods to maximize storage. Expand your storage by remodeling your closets. It’s a great way to organize your home and your life!